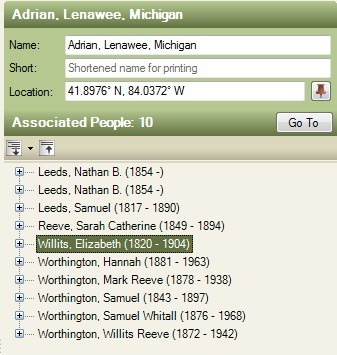 I have been reviewing some data in my genealogy database management program of late, because I found a “new cousin”. This new cousin had a blog called The Barefoot Genealogist. She also can be found on her YouTube Channel. I have actually had the pleasure of meeting her in person. In one of her online events, I saw a place name and several surnames that I am very familiar with. I did a blog post on that not too long ago. Re-Read what you have That really talks about what I am doing with my database. I am re-looking at about 100 Family Group Sheets that I was given by a cousin who has been doing family research for years. In fact my Grandfather’s brother’s family all have been part of this work. About 15 years ago, we even gathered “to tell stories”. My notes reflect that I worked with these Family Group Sheets 13 years ago. 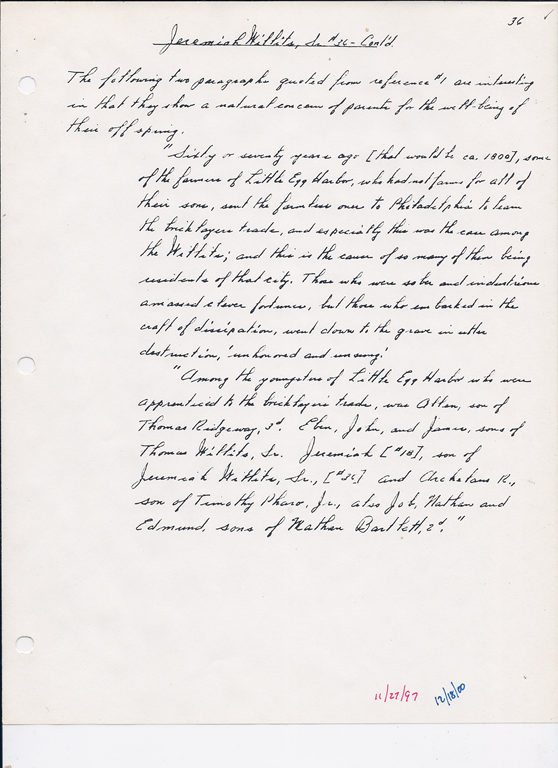 Documented everything AND cited my sources. My major task was to move the source information into the appropriate Evidence Explained format. But because of who the Barefoot Genealogists is, I thought I better get my act together. In doing so, I looked at every Family Group Sheet that I have, but focusing on this specific “line” to make sure I captured everything. I didn’t miss much the first time. In fact, I hadn’t done too bad of a job. But my genealogy database management program has added many features, I wanted to make sure I had the data entered to take advantage of those features. Note where notes belong, research notes where they belong, remove timelines as my software can do that more accurately, and really identify the source material that made up the research for these Family Group Sheets. In an article (not documented yet) is has terms like “Widow Burt”, “old goody Burt”, “awld wich” in it. It talks about a complaint against her “for witchcraft”. Hmmm. There was no indication that there were any actions taken against her. But wait, this is in Lynn, Massachusetts and I am working on a line in Little Egg Harbor, New Jersey. Same person, same family ??? What’s going on here? What are Quakers from the Massachusetts Bay Colony doing in Fenwick’s Colony? Looking around a little more in my New Jersey folks are mentions of several other families from Long Island, also within a generation moving “south”. So, what is going on? Witches, Quakers, mid-1600’s ?? For grins and giggles my daughter did a Google Search for “Quakers In Mass”. The hint may be here. I knew of the Puritans in Massachusetts, and that there were Quakers there as well. In fact I have “The Naked Quaker” by Diane Rapaport (Commonwealth Editions – Carlisle, Massachusetts, 2007) sitting on my bookshelf, in my Must Read section of my library. But it’s what I didn’t know that the Google Search helped me understand. They didn’t like one another, I guess. Ann Austin and Mary Fisher, two Englishwomen, become the first Quakers to immigrate… the ship carrying them lands at Boston in the Massachusetts Bay Colony. Since Salem and Lynn are on or near the water, I guess that some of the Quakers got on boats, traveled south, dropped some off in Rhode Island, maybe picked some passengers up along the way, like on Long Island. Perhaps they heard of Fenwick, in West Jersey and headed in his direction (gotta read more on this). Something must have taken them to what is Tuckerton, New Jersey. Egg Harbor, Little Egg Harbor and found some of Fenwick’s folks in the area. I am finding the connection with Fenwick and this south Jersey area with the West Jersey Quakers. Sounds like what WAS Burlington County, West Jersey was “Quaker Friendly” as compared to Lynn, Mass. I should mention that I made a comment on the New England Geneablogger Facebook Group about this finding, and within about 1/2 hour, I had 2 new cousins, both of whom I have met. Heather Wilkinson Rojo of Nutfield Genealogy and I are 10th cousin’s according to our records. All of this because I “Re-Read What” I have. 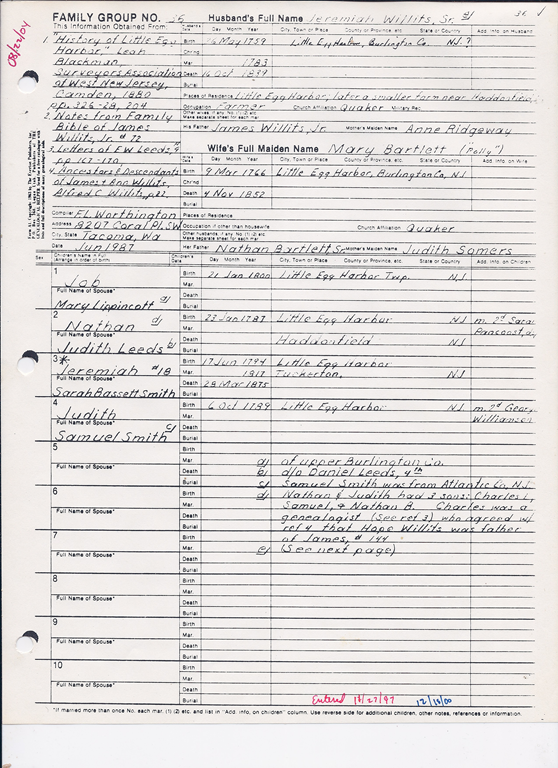 1 Fayette Loomis Worthington, Worthington Family Group Sheet Collection; Fayette L Worthington, Tacoma, WA 98498, 1999. Family Group No. 01248; dated Aug 1987. Record for Roger Bassett. John Worthington (1618-71) was master of Jesus College and Vice-Chancellor of Cambridge. Other Worthingtons were nonconformist ministers: John of Dean Row, and Robert of Mottram-in-Longdendale, who in the 1640′s fought the power of established church. Samuel Worthington was on of the 1st to follow Fox’s Quaker movement to Penn. in America. John’s diary is free to read on line and it’s quite interesting!.